I've just finished the last slice of this incredibly delicious cake and wouldn't mind having one more, but it's gone now...and all that is left is a lonely dirty plate with a few crumbs and these pictures to remind me that this is one of the yummiest cakes I've ever baked. It was my dad's birthday yesterday and, obviously, I was in charge of baking the cake. 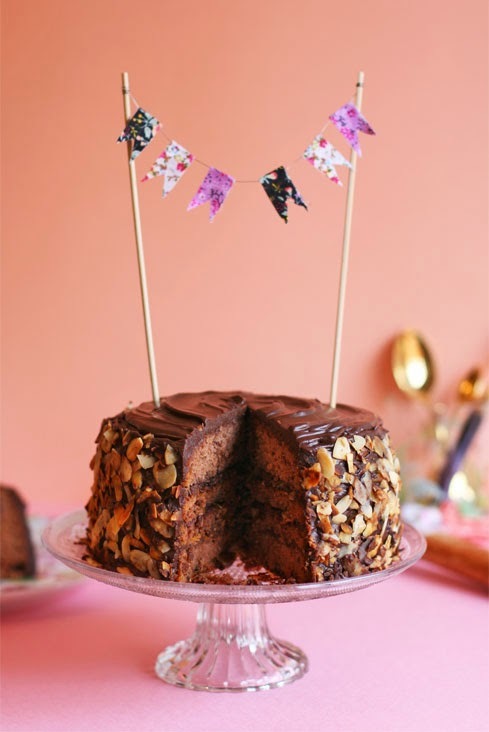 I thought of making a tall cake but using a small pan to make it look cute and found a great recipe in the cookbook Vintage Cakes (btw, what a lovely book with gorgeous and timeless recipes!). I made a healthier (with less saturated fats) version of the Jam Cake by Julie Richardson, replacing the butter for olive oil and using a different kind of chocolate ganache. I was so happy with the results! 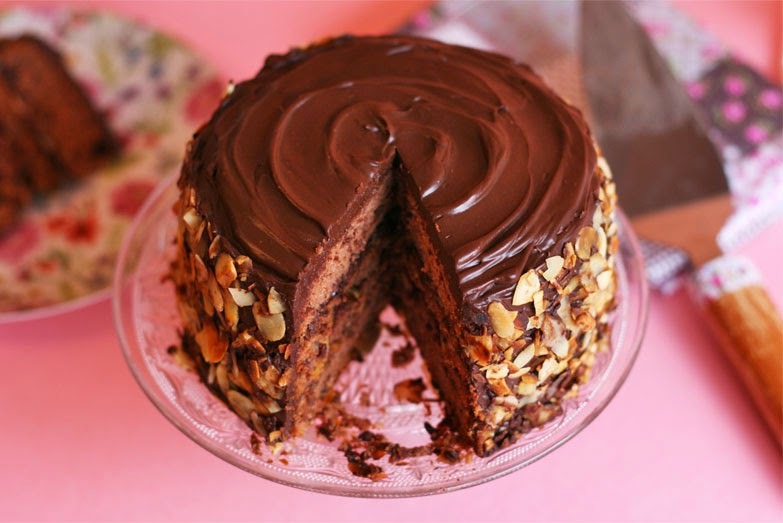 This cake is so aromatic, moist and mouth-watering it was love at first bite. It has become a family's favorite and everybody wanted a second slice. No doubt I will be baking this one again very soon trying with different jams to create new tastes. The jam is not only a filling between layers, actually the blackberry jam I used is an ingredient in the batter and that gives the cake a beautiful berry color. 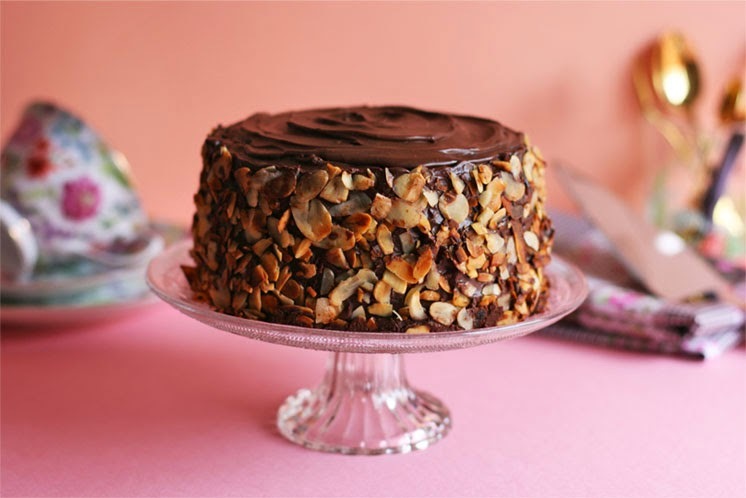 One more thing that makes it special are the toasted almonds, sprinkled over the ganache in each layer and on the sides of the cake. Maybe this was one of the things that surprised me the most: finding the almonds inside with the dark chocolate ganache it's a feast for your taste buds! Toasted almonds plus dark chocolate equals endless joy. 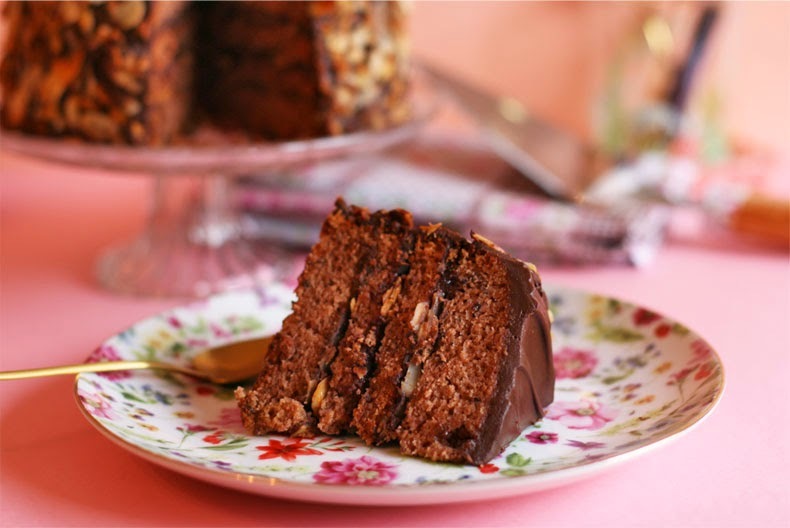 (recipe adapted from 'Vintage Cakes' by Julie Richardson). 1/3 cup plus 2 tsp buttermilk, at room temperature*. 1/4 cup plus 1/2 tbsp olive oil. 2 eggs, at room temperature. 1/2 cup sliced natural almonds, toasted. 8 ounces (227g) dark chocolate, chopped. 1 cup plus 2 teaspoons non-fat milk. Pour the lemon juice over the milk, stir together and set aside 10 minutes at room temperature. The milk will look curdled, don't panic cause that's the texture we need. Stir again this mixture right before using it (at room temperature, do not forget!). With this recipe you'll have enough buttermilk for the cake so you can store the leftovers in the fridge. Grease two 6in x 4in (15cm x 10 cm) round baking pans and line the bottoms with parchment paper circles. In a large mixing bowl, sift together the flour, baking soda, cinnamon, nutmeg, cloves and salt, whisk the mixture to combine all the ingredients. In a separate bowl, stir together the buttermilk and the blackberry jam. In the bowl of a stand mixer fitted with the paddle attachment, beat together sugar and oil on medium-high speed until well combined, about 5 minutes. Stop the mixer frequently and scrape the paddle and the sides of the bowl with a rubber spatula. Blend in the eggs one at a time adding the next one as soon as the previous one has disappeared into the batter. Add in the flour mixture in three parts (on low speed), alternating with the buttermilk mixture in two parts, beginning and ending with the flour. After each addition, mix until just barely blended and stop and scrape the bowl. Stop the mixer before the last of the flour has been incorporated and complete the blending by hand with a rubber spatula to ensure you do not overmix. Divide the batter evenly into the prepared pans. Bake in the middle of the oven until a toothpick inserted in the center comes out clean, around 34 minutes. Cool the cakes on a wire rack for 30 minutes before removing them from their pans. Once removed, continue to cool the cakes on the rack, top side up, until they reach room temperature. While the cakes are cooling we can prepare the maple chocolate ganache. Pour the soy milk into a small saucepan and bring to a gentle boil. Immediately remove from heat and add the chocolate and maple syrup. Use a rubber heatproof spatula to mix the chocolate until it is fully melted and smooth. Set aside at room temperature till ready to use. Place one of the layers, top side up, on a flat plate or a cake board. 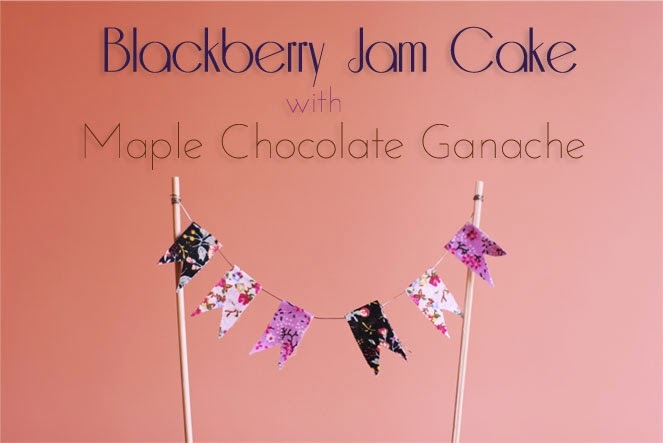 Using a thin metal spatula, spread a very thin layer of blackberry jam and then a thin layer (more generous than the jam) of chocolate ganache on top of the cake and out to the edges of the cake. 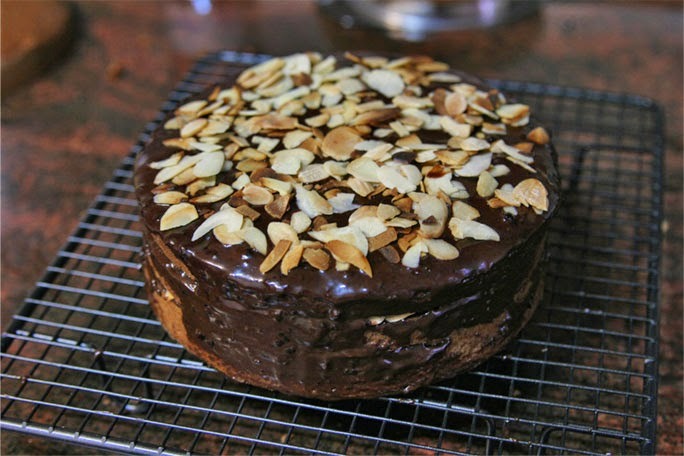 Sprinkle 2 tablespoons of toasted almonds evenly over the ganache. 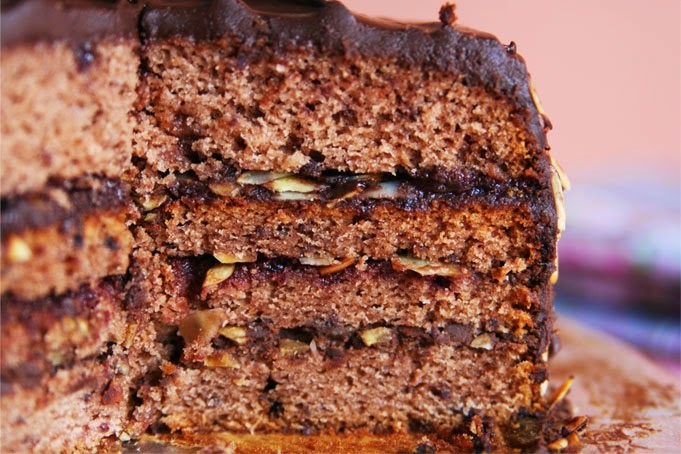 Align the next layer cake on top of the first one and repeat with another layer of jam, ganache and almonds. Place the final layer of cake on top of the cake. Frost the top heavily and the sides lightly with the remainder of the ganache. 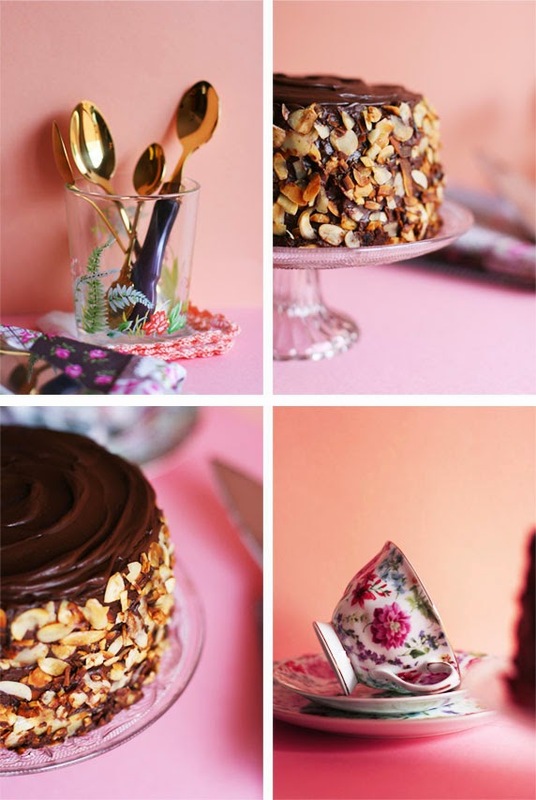 Lightly press the remaining toasted almonds on the sides of the cake. This cake is best served at room temperature. 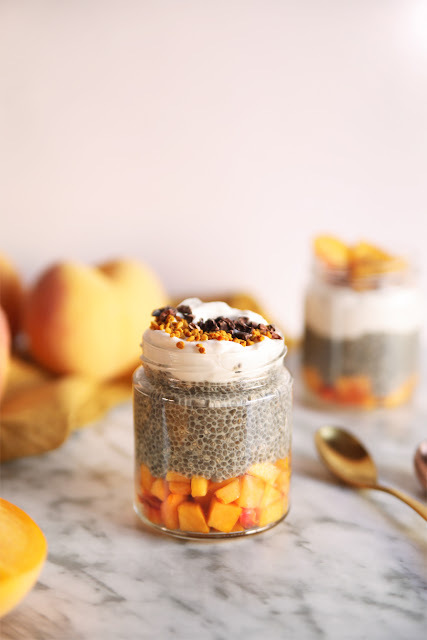 Keep the leftovers in an airtight container in the fridge for up to 5 days. Thank you so much for your comment! =) and welcome to my blog! Yes, this cake was super delicious and so tasty! WOW! This looks a-ma-zing! 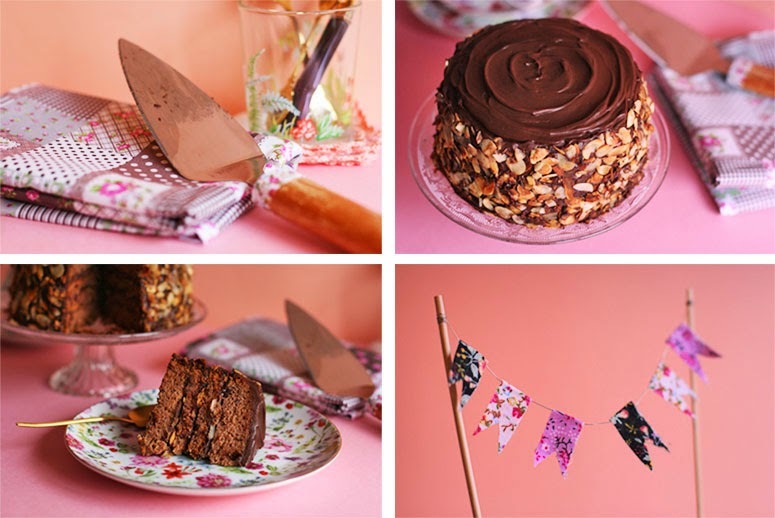 Please, please come link it to #CookBlogShare over on Supergolden Bakes. Btw, what do I have to do to link my recipe? Maybe it's a dumb question but I've just visited your blog and can't find where to link it to. Wow. The flavour combo sounds lovely and the execution is just beautiful. Stunning photography too. Yeah, I didn't try such combination before but the blackberry jam in the batter and as a filling, combined with the toasted almonds, is great. Let me know if you try it someday! Muchas gracias Ana! Es una de mis combinaciones favoritas. Nunca había probado a poner las almendras laminadas entre las capas de un pastel (sólo las había utilizado como decoración) pero me ha encantado.